Wilton Manors, Florida seems to have a different LGBT function ever week, dozens a month, hundreds a year as it is one of the gayest places in th country with 15+ bars, many restaurants, all within a mile stretch. With its proximity to down town Fort Lauderdale and a short drive from Miami, it's a great place to visit as well as live. There are a lot of bear activities in this town as it seems Bears are the more popular gay animal in WM (Is Being A Bear More Desirable In Some Towns Than Others?). One of the functions that has been receiving not so good press over the past year has been Beach Bear Weekend. I read recent stories about some of the claims of scandal, threats, bad blood, and even criminal activity. Was it just bickering between bitter people or was there something behind it. Two such stories were Beach Bear Weekend Bans Sisters of Perpetual Indulgence [UPDATED] and Beware: Beach Bear Weekend 2016. I didn't share those stories with the Instinct audience, but now, recent events and threats have changed my mind. I reached out to Tim Peacock, the Managing Editor and founder of Peacock Panache. He has worked as a civil rights advocate for over twenty years. During that time he’s worn several hats including leading on campus LGBT advocacy in the University of Missouri campus system, interning with the Colorado Civil Rights Division, and volunteering at advocacy organizations. He was more than happy for us to share his coverage of most recent developments in this story. Here is his entry at Peacock-Panache.com entitled "Beach Bear Scam Artist Threatens Orlando-Style Massacre." 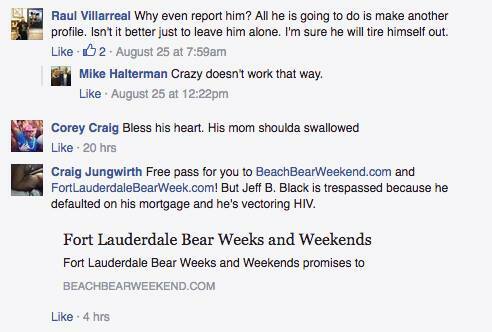 Earlier this year we reported on Craig Jungwirth – a man who took over the Beach Bear Weekend event in Florida and used it to solicit and scam money from unsuspecting members of the LGBTQ community. What began as a story of his harassment of the Sisters of Perpetual Indulgence exploded after information surfaced that not only were the events listed for his Beach Bear Weekend event fake but also all hotel bookings through the event website didn’t actually reserve local hotels (as they’d never spoken to Jungwirth or any event organizers). I’m gonna be killing you fags faster than the cops kill niggers. It’s time to clean up Wilton Manors from all you AIDS infested losers. A loosely-organized group of individuals has been working to report Jungwirth to local and federal authorities though no one has returned anyone’s calls yet – even local law enforcement offices in and around the Ft. Lauderdale area where the threats are being made. We’ve reached out to law enforcement as well as local government officials and will update this article should they provide a statement. Jungwirth’s escalation from internet troll and scam artist to person making threats of domestic terrorism doesn’t come as a large surprise given his obsessive stalking history as well as his criminal record including multiple restraining orders. We spoke with several people in and outside of Wilton Manors (just outside of Ft. Lauderdale) and the story is consistently the same. Jungwirth relentlessly harasses anyone who criticizes him or attempts to expose his illegal dealings. 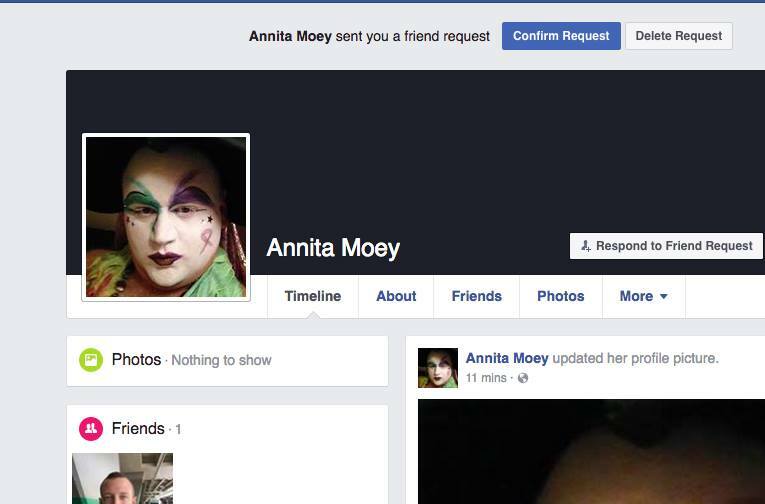 He creates fake profiles posing as real people (like Brian Hamilton, who I know personally) in order to steal others’ identities and access their friends’ and family’s personal information. According to local sources, the last time Jungwirth’s behavior escalated he vandalized a bar in Wilton Manors after driving by screaming obscenities. If you live or will be vacationing in Southern Florida during Labor Day, please be careful as Jungwirth’s threats cannot be written off as unrealistic based on his previous behavior. Our Agency is aware of this information and we are conducting an investigation into this matter. Due to this being an on-going investigation our agency is prohibited from discussing this issue any further at this time. A local source in Wilton Manors just informed us that after speaking with the Wilton Manors Police Department, he learned local law enforcement are working with the FBI on the investigation. 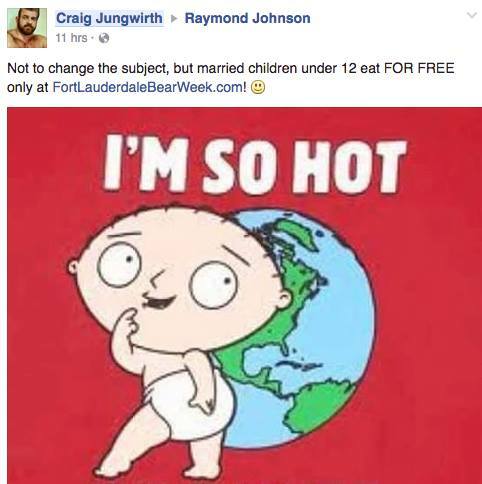 Moreover, Jungwirth is being actively sought out by law enforcement for questioning in relation to his online statements and ongoing harassment as they have begun taking his threats seriously. Once again, thank you Tim Peacock for letting us share your story. As you can see, he has been writing on this topic for some time and does keep updating the information as it comes in. Please visit peacock-panache.com to keep up on this story. We don't need to see another Pulse – like tragedy. We don't need to see any kind of tragedy. To threaten such an act is inhumane and wrong especially from someone that was supposedly planning an event that would bring LGBTers together. As I said, I have sat on this story for a while, but in seeing that it is not going away and now Wilton Manors and the F.B.I. are involved, it should be shared. There have been no charges brought against Jungwirth as of yet for this most recent act / threats, but we do report on threats and social media posts, like the 'Christian Warrior' Arrested After Threatening To Kill Gays & Satanists as well as Azealia Banks Trolls Zayn Malik Again, This Time On Instagram. Those two cases helped me realize that this is worth sharing. I've also had several friends that are highly involved in the bear community that have been affected by this most recent action as well as the previous actions of this individual. Enough is enough. We would like to thank those that do work tirelessly to coordinate all of the positive and influential events that are planned for our communities. We cannot let this one confusing / threatening incident tarnish our community. We can learn from it and grow. You can learn more about Tim Peacock at his personal website. Are Bears Becoming The Desired Gay Man?